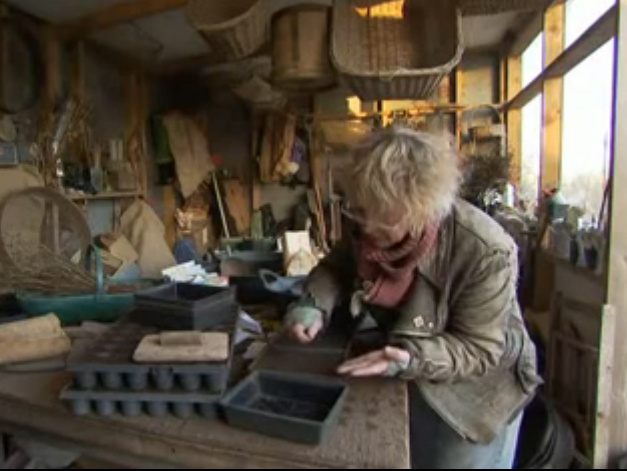 Scott recently turned me on to Carol Klein's wonderful BBC series Life in a Cottage Garden. BBC gardening shows are completely unlike the gardening shows we have in the U.S. They feature actual gardeners instead of landscape architects who are more concerned with your hardscaping and where to place your lavender plants. Carol Klein is wonderfully goofy, exclaiming over discoveries in her garden, lamenting dead plants, then immediately and unapologetically finding a replacement. It's so wonderful to see her running around in January in a ratty motorcycle jacket, dirty fingernails digging through her compost (pronounced COMpawst) heap. She would never get on American TV, which is a shame. She's muddy and a little bit crazy, like most gardeners. I learned so much about plant propagation just from the first episode. She inspired me to try propagating some of my plants, like my Echium candicans 'Star of Madeira' and my 'Little Honey' Oakleaf Hydrangea. I took two different approaches with the hydrangea: layering (which I learned about from Ricki) and cuttings tucked into "some nice gritty COMpawst." Hopefully they'll all take and I'll have some to share and some to tuck into the beds. It's such a small bright thing, why not make more? They don't look super great right now, what with our heavy rain and humidity. I'm hoping they rebound. I'm not sure the echium cuttings will take but there's no harm in trying. I love that Carol takes cuttings of her tender plantings to her greenhouse, just in case the mother plant doesn't make it through the winter. So smart! This spring was my first real foray into seed starting and I had mixed results. The Amsonia hubrichtii seeds from Nan Ondra sprouted and I've potted them up in the hope that they'll be transplanting size next spring. I had one lone Rudbeckia maxima seedling that I coddled and babied until I realized it was a weed. I felt so dumb. When I started gardening I'd read gardening blogs and despair at the unending list of things those gardeners were doing: mulching, pinching back, deadheading, weeding, fertilizing (with what sounded like a different one for every plant! ), pruning, thinning, collecting seeds, weeding, propagating . . . I thought I'd never have a nice garden because I didn't have time for all that. Every year I manage to add something new to my routine; this year I started deadheading things and it doesn't take much time or energy. And if I forget it's okay, too. Everything builds from year to year and you get to the point where you don't feel so much like you're behind the eight ball. I mean, spring will always be crazy and my garden will always have things needing doing, but I actually fertilized my bamboo (and that weed I thought was Rudbeckia) this year! Go me. Are there any other wonderful gardening shows I'm missing out on? I'm looking forward to spending time this winter tucked under a blanket, watching them. You'll have watch BBC ' Gardeners World' she's on every week ! You rule. Thank you so much! I need to chat with you sometime about how you find and access your Brit shows. It's so good! I practically watched the whole season in one sitting. Oh My, thanks for the show recommendation. I'm going to have to check that out. I despise our American gardening shows, they are all so lame. Good for you trying out your hand at starting cuttings. I stick things all the time, some take, some don't. Whenever I break a branch off something usually accidentally, I scrape the bark and stick it in a pot with some dirt. I've been gardening for nearly 20 years, and I still don't have all the stuff you're supposed to do down pat. Some years I'm more conscientious than others. I hardly ever fertilize anything, I really should. But I do use a lot of COMpawst. Thanks for tipping me off to this show!